The new space from Kevin and Terresa Davis, founders of Steelhead Diner and Blueacre, has room for improvement in the kitchen and on the floor. They have dessert down pat, though. “How’s the pork chop?” the fellow seated nearby asked his companion as I eavesdropped on their dinner conversation. 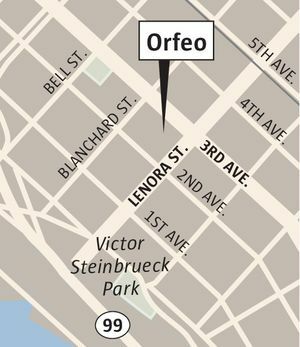 Like those guys, I was hoping for memorable, not meh, at the new Belltown restaurant, Orfeo. It’s not OK when a restaurant serves as many underwhelming or poorly executed dishes as I encountered here. Especially not at these prices. It’s a concept as amorphous as the restaurant’s name, inspired by literature, art and Greek mythology. In Greek mythology, Orpheus is a musician who charms everyone and everything with his lyre. Eurydice is the love of his life. Their saga ends tragically but she has a better-than-OK cocktail named after her here, made with gin, lime juice and a hint of lavender. Orfeo might have been more aptly named Phoenix. 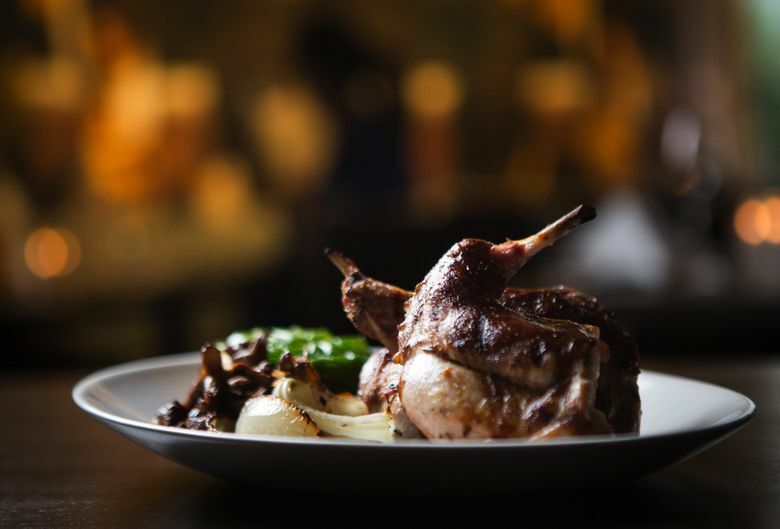 It rose from the long-cooled ashes of Brasa, still fondly remembered for Bryan Hill’s suave front-of-the-house presence and the rustic, wood-fired Mediterranean-style cooking of chef Tamara Murphy, who now owns Terra Plata. The floor plan is still the same, with a curving half-wall between the dining room and lounge. The high-top table is gone, but the same bar, with its tufted front, sits in the far right corner. Davis is a fan of Mark Helprin’s 1991 novel, “A Soldier of the Great War.” Its plot involves a nefarious fellow named Orfeo and a Renaissance painting by Giorgione called “La Tempesta.” The painting is reproduced here in the lounge, as a large, fractured mural that rivets the eye. Parts of it are repeated in small light boxes mounted in the dining room. Giorgione’s moody blues, browns and greens dictated the restaurant’s color scheme, but patchy lighting in the dining room undercuts the richness of those hues. Large Edison bulbs glare above the cupped booths that rim the perimeter, while widely spaced ceiling spots illuminate some tables but leave others in the dark. The kitchen, visible through a long, rectangular pass-through, still looks like a movie in letterbox format. 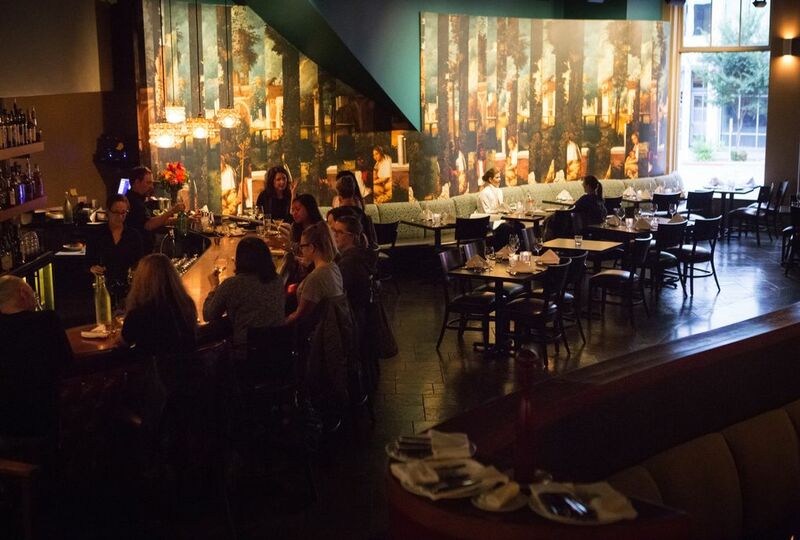 Davis kept Brasa’s wood-burning oven and added another fueled by charcoal. They bake pizza and several breads on site, including fougasse, a beautiful Provençal flat bread scored like a sheaf of wheat. 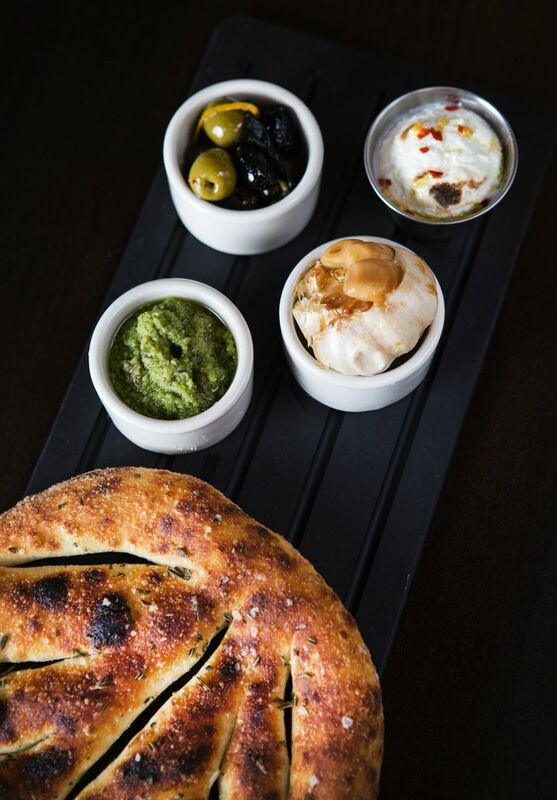 It’s served hot from the oven, accompanied by ricotta, olive tapenade and roasted garlic. A different dough is used for pizza. I liked the flavor but was disappointed in the soft, doughy texture of the crust. It had none of the crackle you expect in a wood-fired pie and the “simple” cheese version was overburdened with mozzarella and unnecessarily embroidered with sun-dried tomato. Pasta, all made in house, could use some improvement. Bulky, badly wrapped tortellini, filled with a bland, gristly mix of chicken and mozzarella, sat in lackluster chicken broth, weighed down with grated Parmesan, spinach and still-crunchy chopped carrots. Bavette noodles, slightly wider than linguine, showed more finesse, but their spunky clam-and-chorizo sauce was excruciatingly salty. Polenta-stuffed grilled quail and moist grilled rabbit, sporting a robust brown sauce zingy with mustard, stood out among entrees. The tiny quail (just one for $28?) was planted in wild mushroom risotto fragrant with fennel and truffle. The tender rabbit legs and loin came with under-roasted onions and a clunky disk of polenta baked under a cap of mozzarella. Grilled king salmon more than an inch thick was dry, but roasted peppers and a tart green herb sauce pungent with capers and anchovy salvaged both the fish, and plain potatoes under it. Fried rockfish paired with fried red onion rings were a dreamy appetizer twosome made for dunking in sweet-hot mustard vinaigrette. Espellette pepper gave an agreeable kick to another starter, chicory salad bolstered with cannellini beans and coiled ribbons of oven-roasted squid. A shareable side dish of Romano beans with brown butter, sage and hazelnuts was a delight. Two-month-old Orfeo has room for improvement in the kitchen and on the floor. Service was exasperating at every turn. Flatware was collected but not replaced. Servers habitually arrived with entrees before appetizers were out of the way, then were flummoxed as to what to do with them. Fresh share plates, brought at our request, were placed next to the used ones, which were then collected with fumbling hands. “And then it all ran together, like a song.” So goes the last line of Helprin’s novel. Wish I could say the same here.